What’s the Best Indoor Hot Tub in 2016? For many people, being able to own their own hot tub is a top fantasy. Unfortunately, those hopes are usually dashed upon finding out the price of one. The concrete base, the shipping of the tub, the plumbing required. The entire process adds up, and quickly. That is usually where people give up. Few people can afford to shell out thousands for something that isn’t a necessity. And that’s just one reason; there are more. Rental properties normally can’t be renovated, and a spa can take up most of a small back garden. But that doesn’t mean that you’re out of options! 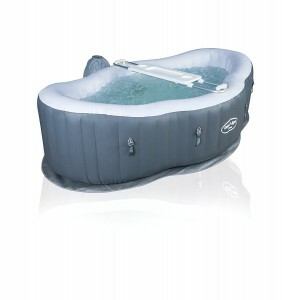 If you find yourself unable to buy a permanent hot tub, you can simply purchase an inflatable one, instead! Inflatable hot tubs are a growing trend around the world, and it’s no wonder why. Besides being just as relaxing as their more expensive counterparts, these tubs also have the added bonuses of being a great deal cheaper, easy to install with no professional skills necessary, and completely portable. 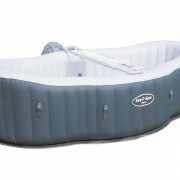 However, looking for the perfect inflatable spa to use inside your home can be a daunting task. With so many on the market, there might be some trepidation in making your choice. Well, we decided to narrow down the choice for you to just three options, which we have selected due to their smaller size (making them a more realistic option for the inside your home) as well as their superior features. Are you in the market for an inflatable spa, but don’t want to break the bank to get one? Then the Lay-Z-Spa Miami is the perfect hot tub for you! 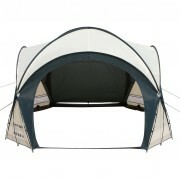 One of the best features that this model has to offer is the low price tag: The average price is only £399! 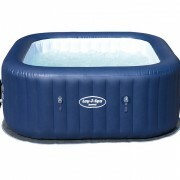 Compared to the Lay-Z-Spa Siena and the Intex Octagonal Bubble Spa, it’s a steal! But this tub has other perks, as well. If you’re looking for something that you can invite your friends in to during visits, or perhaps a way to unwind as a family, this is a great option. Unlike the Siena, it is large enough to easily accommodate between two and four adults comfortably, making it a wonderful choice for entertaining. If you’re more interested in the features, then don’t fret! This inflatable hot tub has the stress-melting perks that everyone wants out of their spas. The water can be heated to a blissful 40 degrees Celsius, but can be set lower. This is especially important for people with little ones to worry about, or for those with temperature sensitivities. The Miami also comes with a Lay-Z-Massage Jet System, which is perfect for targeting those stress-filled spots and easing them away. 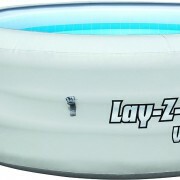 The Lay-Z-Spa Miami comes with extras that you will find useful in setting up and maintaining your inflatable spa. This includes a chemical floater, two charcoal filters cartridges, a spa maintenance guide, and an instructional setup DVD. To read our full review of the Miami click here. So many hot tubs seem to be marketed for use by a large group. But what if you want a spa just for you? Or maybe one to share with a special someone? 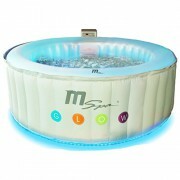 If that seems to fit your wants and needs, then you’ll love the Lay-Z-Spa Siena! This fully-functional, yet completely portable, spa is the perfect choice for those who want to soak in privacy. This inflatable spa holds one or two people, giving it intimacy lacking in the Lay-Z-Spa Miami and the Intex Octagonal Bubble Spa. Though it is built to hold fewer people, that doesn’t mean that this hot tub will leave you wanting! 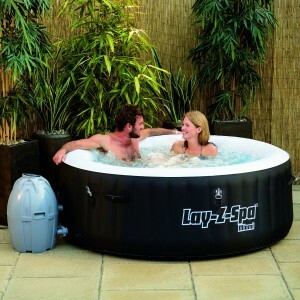 The Lay-Z-Spa Siena was designed to give users the most relaxing experience possible. To help you really enjoy your soak, this inflatable spa comes with a Rapid Duel Operate Heating System, which will quickly heat the water to 40 degrees Celsius, the perfect temperature to ease stress away. For those who like a bit of bubbly counter-pressure at the end of a long day, it also comes with an Airjet Massage System. 127 of these jets circle the tub, giving you soothing pulses of water exactly where you need it. Do you have to plan out your doses of calm a while beforehand? Then you’ll love this rather unique perk offered by the Siena: A power saving timer. With this, you can set up your spa up to seventy-two hours in advance. This all comes with a heavier price tag than the others, of course. The average price is £699. But you certainly get what you paid for! Another bonus: All Lay-Z-Spa Siena purchases come with a one year warranty. To read our full review of the Siena click here. If you’re looking for an all-inclusive, guess-work free hot tub, then you’ll definitely want the Intex Octagonal Bubble Spa! Though this inflatable spa certainly has many amazing perks and pleasures, the fact that it comes so well supplied is possibly its best feature. Unlike the Lay-Z-Spa Miami and the Lay-Z-Spa Siena, which both came with the minimum equipment needed to maintain it, the Intex comes with an itemized list of anything you may need for your hot tub. This includes basics, such as the tub itself, as well as things to make upkeep easier, such as a spa cover to keep out insects, leaves, and other debris. It even comes with a wrench, to help you put everything together! 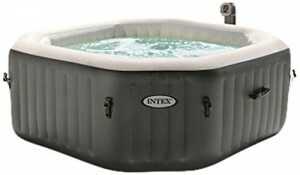 But helping you be over-prepared isn’t the only good thing about the Intex Octagonal Bubble Spa. Not even close! This tub boasts a litany of ways to help you settle in and relax. The heating system can set and maintain a temperature between 20 degrees Celsius and 40 degrees Celsius, perfect for those who have to make concessions for children, the elderly, or people sensitive to heat in general. And what would a hot tub be without jets? This one has 120 bubble jets around the tub, to help massage away your worries. The best, and most unique, part? The temperature and the bubble jets can be controlled by the control panel, so that you don’t have to rely on trial-and-error. The price, however reflects this, with the average being £599. Still, many feel that it is certainly worth the splurge! To read our full review of the Intex Octagonal click here. So there you have it, three great options for inflatable hot tubs that are on the smaller side but which still offer all of the benefits of your very own blow-up spa, meaning you can enjoy a relaxing soak away from the wind and rain, inside your home.